By the time she returns, Gowtham’s sudden demise will throw her in shock. It is then she comes across Jay Ram (Nani) who gets engaged to Aishwarya (Surabhi). The rest of the film is all about revealing about the murder mystery of Gowtham, and it’s relation with Jay. Watch Gentleman movie to know about the rest. Analysis: The first half of the film reveals and promises fresh entertainment and engaging love stories. The movie has been decent with sensible entertainment and lively performances by the lead actors. The songs have been decent, and the technical aspects take the film to the next level. On the whole, the first half of the flick has been decent with impressive elements throughout. The second half of the movie has been a mix of romance and exciting thrills throughout. The suspense has been maintained till the last frame though the film dips at times. The songs have been good and the production values of the flick take the film to the next level. The climax reveals out the suspense in the most interesting way. On the whole the second half has been presented in a decent way though it has enough predictable episodes. Nani comes out with one more commendable performance in the movie. He has been outstanding and he carried the complete film on his shoulders with his outstanding performance. Niveda Thomas has been decent with her performance and her stunning screen presence is her added advantage. Surabhi has been cute and she has been lively. All the other actors did their jobs with perfection. The story of Gentleman has been decent and interesting. The screenplay has been taken enough care and the dialogues have been impressive. The cinematography is the major highlight of the film and the music has been decent. What makes lot of difference is the background score by Manisharma. The production values have been grand enough. The direction has been decent on the whole. 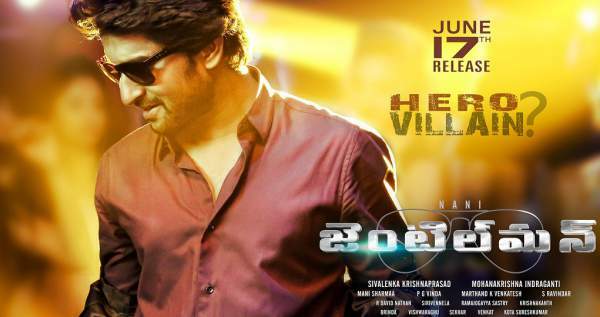 Gentleman is sure a decent thriller that comes from Nani and team. Though it has been predictable at parts, the film ends up impressing the audience.